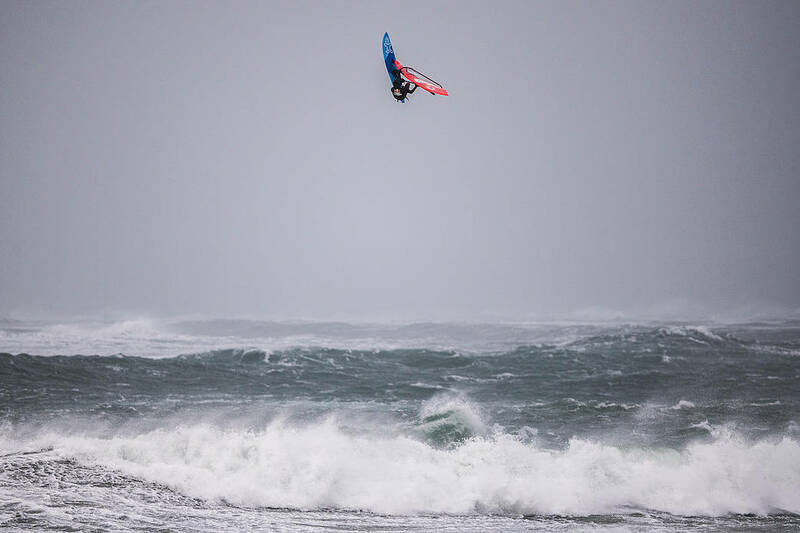 Australian Jaeger Stone wins Red Bull Storm Chase as 131kph wind gusts and 8m waves batter the Irish Coast! March 12th – The powerful forces of a massive North Atlantic storm battered the beaches of northwest Ireland. Eight world-class windsurfers, who had traveled from all corners of the globe, braved the wind and waves for the Red Bull Storm Chase, the world’s toughest windsurfing contest. Having waited over three years for such a storm to arrive, the competitors and crew could hardly believe their eyes at the conditions in front of them. The eight riders headed out in pairs for 20-minute heats in practically balmy 8C temperatures. Judges watched from above the reef as wind and waves increased in magnitude throughout the day – providing an incredible canvas for breath-taking wave rides and eye-popping aerial acrobatics. At the beginning of the day, Philip Köster (Starboard / Severne / Maui Ultra Fins), Jaeger Stone, Leon Jamaer (JP / NeilPryde), and Thomas Traversa (Tabou / GA Sails) led the standings – but with a new wind and wave situation, anyone could win the contest. Highlights of the second day included a nearly-landed double push-loop from Ricardo Campello (Brunotti Boards), and incredible air taka from Philip Köster, and several seriously large aerials from previous event winner Thomas Traversa – but none of them put all the points together to keep Jaeger from claiming the title of Red Bull Storm Chase Champion. Jaeger’s multiple solid wave rides and jumps, along with a biggest wave hit bonus, sealed the deal. The prize-giving ceremony was held on the spot in still-blustery winds and rain, as competitors and organisers thanked local safety and support crew and the welcoming community of Magheroarty for hosting the world’s toughest windsurfing contest. You can see raw footage of Day 2 here and the official highlights here.